I was at gym this morning, and the song, by Taylor Swift End Game was playing. If you haven’t heard this song before, tune in to iTunes and listen to the lyrics. Big Reputation is one of the phrases that struck me. It doesn’t matter if you are Tom Brady, Tiger Woods, Oprah Winfrey or the person you see when you look in the mirror; we all have a Big Reputation. What would others say about you and your reputation? What do you want your end game to look like? What are you doing to be the first string? Are you on an A-Team? This is an important conversation to have, and to really think about how other people see you. It’s our responsibility to manage and protect our reputation. It takes a long time to build your credibility and a positive reputation, and it only takes a second to lose it. 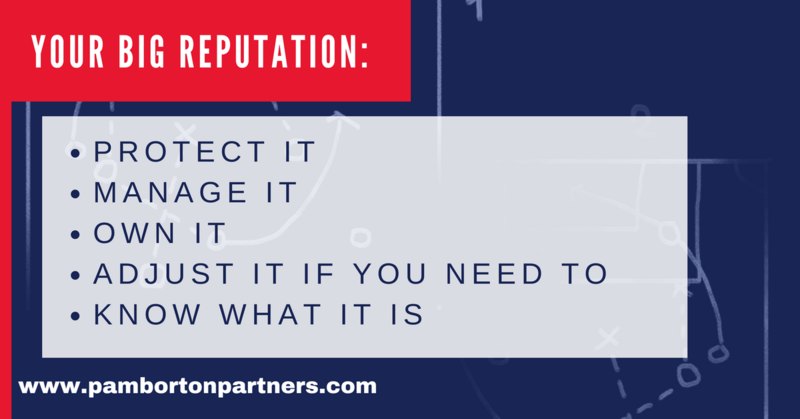 Regardless of industry or environment, this concept is critical…because if you don’t manage and protect your reputation, someone else will manage it for you. There are many haters out there and some get paid a lot of money to dig up dirt, to find the skeletons in the closet, to shine a light on the negative, to create drama, to draw conclusions, and to sway judgment about other peoples’ reputations. Is this fair? No. Chapter 5 in my book is dedicated to a group called the Experts who judged, commented, had their own personal opinions and tried to manage my reputation as a high profile coach. I knew the landscape and territory, and experienced landmines everywhere. As the chief executive in a highly visible position, it was one of the most important lessons I learned. I managed and protected my own reputation, not because it was big…but, because it was MINE! At the end of the day, your reputation is all you have. How are you managing and protecting you your end game!